I'm really excited. Like I'm-going-to-wait-on-the-edge-of-my-seat-until-the-next-book-comes-out excited. The Immortal Rules is the amazing first book in the Blood of Eden series that introduces us to a new world filled with danger and vampires. Allison, a human unmarked by vampires, lives on the streets, scavenging for food when she can find any as she struggles to stay alive. The book is split into parts as she moves onto different moments in her life. From human, to vampire, to wanderer, etc. The world that they inhabit is post apocalyptic america. Chicago is in ruins and vampire cities are scattered across the once country. Their society is complex and really interesting, not some thrown together imaginary world that just full of misfit vampires. However, if your looking for the angst filled romance akin to the Iron Fey Series you're going to be severely disappointed. She meets Zeke towards the end of the middle of the book and although there's a lot of angst, there wasn't a whole lot of romance. A lot more stuff happens but I don't want to ruin the book for you so I'll stop here. But why, you may ask, did I not give it five glasses if I loved it that much? It's because it's the first book. Even though I thought it was super amazing it's only the beginning of the series. As a complex world it took some time to set the scene and introduce all the main players. The beginning I thought was sort of slow and there wasn't a whole lot of amazing plot development throughout the book. But despite its faults, it's just one of those books that's setting up the next one in the most amazing way possible. 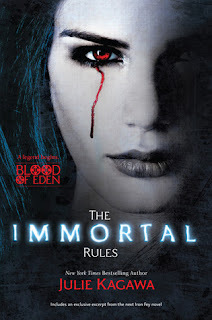 By the end of it, despite the doozy of a cliff hanger, you know that the next book has to make up for the lack of major plot in the first one, because even though the The Immortal Rules was amazing, I think it highlights the beginning of the accent to awesomeness. I don't think Kagawa meant for it to be the most exciting book in the series, but it certainly may be the most important.